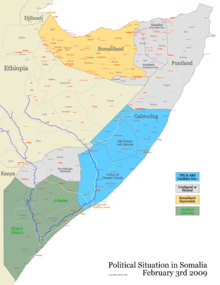 The Somali Civil War was an armed conflict involving largely Ethiopian and Somali Transitional Federal Government (TFG) forces and Somali troops from Puntland versus the Somali Islamist umbrella group, the Islamic Court Union (ICU), and other affiliated militias for control of the country. There is a clear connection between Somali Civil War (2009–present) and the War of 2006. The war officially began shortly before July 20, 2006 when U.S. backed Ethiopian troops invaded Somalia to prop up the TFG in Baidoa. The TFG in Somalia invited Ethiopians to intervene, which became an "unpopular decision". Subsequently, the leader of the ICU, Sheik Hassan Dahir Aweys, declared "Somalia is in a state of war, and all Somalis should take part in this struggle against Ethiopia". On December 24, Ethiopia stated it would actively combat the ICU. Situation of the war in Somalia February 3, 2009. Ethiopia's prime minister, Meles Zenawi, said Ethiopia entered hostilities because it faced a direct threat to its own borders. "Ethiopian defense forces were forced to enter into war to protect the sovereignty of the nation," he said. "We are not trying to set up a government for Somalia, nor do we have an intention to meddle in Somalia's internal affairs. We have only been forced by the circumstances." The ICU, which controlled the coastal areas of southern Somalia, engaged in fighting with the forces of the Somali TFG, and the autonomous regional governments of Puntland and Galmudug, all of whom were backed by Ethiopian troops. The outbreak of heavy fighting began on December 20 with the Battle of Baidoa, after the lapse of a one-week deadline the ICU imposed on Ethiopia (on December 12) to withdraw from the nation. Ethiopia, however, refused to abandon its positions around the TFG interim capital at Baidoa. On December 29, after several successful battles, TFG and Ethiopian troops entered Mogadishu relatively unopposed. The UN also stated that many Arab nations including Egypt were also supporting the ICU through Eritrea. Although not announced until later, a small number of U.S. Special Forces troops accompanied Ethiopian and TFG troops after the collapse and withdrawal of the ICU to give military advice and to track suspected al-Qaida fighters. Both American support for the TFG and various Arab Nations' support for the ICU were isolated cases from the central motive of the war between the allied Ethiopian & Somali government forces and the allied ICU & Eritrean forces. As of January 2007, Ethiopia said it would withdraw "within a few weeks" but the TFG, US and UN officials oppose Ethiopian withdrawal because it would create a "security vacuum," while the ICU has demanded immediate Ethiopian withdrawal. The two sides had traded war declarations and gunfire on several occasions before. Eastern African countries and international observers fear the Ethiopian offensive may lead to a regional war, involving Eritrea, which has a complex relationship with Ethiopia and whom Ethiopia claims to be a supporter of the ICU. As of January 2009, Ethiopian troops withdrew from Somalia following a two-year insurgency, which led to loss of territory and effectiveness of the TFG and a power-sharing deal between Islamists splinter group led by Sheikh Sharif Sheikh Ahmed's Alliance for the Re-liberation of Somalia (ARS) and TFG Prime Minister Nur Hassan in Djibouti. The al Shabaab who has separated from the ICU rejects the peace deal and continued to take territories including Baidoa. Another Islamist group, Ahlu Sunnah Waljama'ah, which is allied to the transitional government and supported by Ethiopia, continues to attack al Shabab and take over towns as well. After the parliament took in 200 officials from the moderate Islamist opposition, ARS leader Sheikh Ahmed was elected TFG President on January 31, 2009. Since then, the al shabab radical Islamists have accused the new TFG President of accepting the secular transitional government and have continued the civil war since he arrived in Mogadishu at the presidential palace. Forces involved are difficult to calculate because of many factors, including lack of formal organization or record-keeping, and claims which remained masked by disinformation. Ethiopia for months leading up to the war maintained it had only a few hundred advisors in the country. Yet independent reports indicated far more troops. According to the BBC, "The United Nations estimated that at least over 9,000 Ethiopian troops may be in the country while the AP suggests the number closer to 12–15,000, while regional rival Eritrea has been accused of deploying some 2,000 troops in support of the Islamic group. This claim has never been proven nor are there any indications that they are true. Wars between Somalia, or its precursor Islamic states, and Ethiopia, stretch back to 16th century. For example, Ahmad ibn Ibrihim al-Ghazi was a 16th-century Islamic leader popular in Somali culture for his jihad against the Ethiopians during the rise of the Adal Sultanate. The painful living history, oral and cultural traditions, long-standing ethnic divisions and sectarian differences lay a foundation of conflict between the two nations. More recently, boundary disputes over the Ogaden region date to the 1948 settlement when the land was granted to Ethiopia. Somali disgruntlement with this decision has led to repeated attempts to invade Ethiopia with the hopes of taking control of the Ogaden to create a Greater Somalia. This plan would have reunited the Somali people of the Ethiopian-controlled Ogaden with those living in the Republic of Somalia. These ethnic and political tensions have caused cross-border clashes over the years. 1998–2000 Cross-border warfare during the chaotic fraction leader-led era. Even before the beginning of the war, there have been significant assertions and accusations of the use of disinformation and propaganda tactics by various parties to shape the causes and course of the conflict. This includes assertions of falsification of the presence or number of forces involved, exaggeration or minimization of the casualties inflicted or taken, influence or control of media outlets (or shutting them down), and other informational means and media to sway popular support and international opinion. Ethiopian troops moved into Somali territory on July 20, 2006. On August 1, 2006, the ICU sent technicals out towards the Ethiopian border north of Beledweyne. Ethiopian troops were reportedly sent across the border to stop the ICU's advance. On October 9, it was reported Ethiopian troops seized Burhakaba. Another article seemed to indicate the Ethiopian control was a troop convoy passing through. Islamists claim the town reverted to their control after the Ethiopians departed. SomaliNet reports the elders asked the government to leave to avoid bloodshed in their town. The article said it was government troops, and not Ethiopians who had come to the town. An Ethiopian column of 80 vehicles was hit by landmines and then attacked with gunfire by a group of about 50 troops loyal to the ICU on November 19, 2006, near Berdaale, 50 kilometres (30 mi) west of Baidoa. Six Ethiopians were reported killed in the attack. Two Ethiopian trucks burned and two were overturned. On December 8, 2006, fighters from Somalia's Islamic Courts Union clashed with Somali government forces, allegedly in cooperation with Ethiopian troops. Sheikh Sharif Sheikh Ahmed, head of the Islamic Courts, told a crowd in Mogadishu that fighting had started in Dinsor in the south, and called on all Somalis to "stand up and defeat the enemies". Another official said Ethiopian troops had shelled the town of Bandiradley. The Deputy Defence Minister of the Somali government, Salat Ali Jelle, confirmed the fighting but denied any Ethiopian troops were involved. The Ethiopian government has denied repeated claims that its troops are fighting alongside Somali government militia. Witnesses in Dagaari village near Bandiradley said that they saw hundreds of Ethiopian troops and tanks take up positions near the town with militiamen from the northeastern semi-autonomous region of Puntland. On December 13, a Reuters report said that the ICU claimed 30,000 Ethiopian troops were involved in Somalia, while 4,000 foreign fighters were involved on the side of the ICU. Ethiopia denied having troops other than "military advisors" present. December 19, 2006: Aweys received medical treatment in Egypt just before the beginning of the war against the UN-backed Transitional Federal Government (TFG) and Ethiopian troops. December 20, 2006: Major fighting broke out around the TFG capital of Baidoa. Thirteen trucks filled with Ethiopian reinforcements were reported en route to the fighting. Leaders of both groups briefly kept an option open for peace talks brokered by the EU. December 21, 2006: As the fighting intensified with Ethiopia, he took a flight to an undisclosed location with Yusuf Mohammed Siad Inda'ade, and, rather than news of medical treatment, it was said he was on the hajj. December 22, 2006: Nearly 20 Ethiopian tanks headed toward the front line. According to government sources Ethiopia had 20 T-55 tanks and four attack helicopters in Baidoa. December 23, 2006: Ethiopian tanks and further reinforcements arrived in Daynuunay, 30 kilometres east of Baidoa; prompting ICU forces to vow all-out war despite a commitment to an EU-brokered peace. Heavy fighting continued in Lidale and Dinsoor. December 24, 2006: Ethiopia admitted its troops were fighting the Islamists, after stating earlier in the week it had only sent several hundred military advisors to Baidoa. Heavy fighting erupted in border areas, with reports of air strikes and shelling, including targets near the ICU-held town of Beledweyne. According to Ethiopian Information Minister Berhan Hailu: "The Ethiopian government has taken self-defensive measures and started counter-attacking the aggressive extremist forces of the Islamic Courts and foreign terrorist groups." December 25, 2006: Ethiopian and Somali forces captured Beledweyne. Defending ICU forces fled Beledweyne concurrent to Ethiopian airstrikes against the Mogadishu and Bali-Dogle airports. Heavy fighting was also reported in Burhakaba. On December 26, the ICU was in retreat on all fronts, losing much of the territory they gained in the months preceding the Ethiopian intervention. They reportedly fell back to Daynuunay and Mogadishu. December 27, 2006: Ethiopian and Somali government forces were en route to Somalia's capital, Mogadishu after capturing the strategic town of Jowhar, 90 km north from the capital. The ICU were in control of little more than the coast, abandoning many towns without putting up a fight. Also, the ICU top two commanders, defense chief Yusuf Mohammed Siad Inda'ade and his deputy Abu Mansur were away on the Hajj pilgrimage in Mecca. After the Fall of Mogadishu to the Ethiopian and government forces on December 28, fighting continued in the Juba River valley, where the ICU retreated, establishing a new headquarters in the city of Kismayo. Intense fighting was reported on December 31 in the Battle of Jilib and the ICU frontlines collapsed during the night to artillery fire, causing the ICU to again retreat, abandoning Kismayo, without a fight and retreating towards the Kenyan border. December 27, 2006: Aweys, along with a group of several hundred fighters from the Hizbul Shabaab wing of the ICU fled Mogadishu, presumably to the former AIAI base at Ras Kamboni. On December 31, 2006, he vowed to fight on, and called for others to create an insurgency against the government. Meanwhile, a heavily armed column of government and Ethiopian troops advanced from Mogadishu through Lower Shabelle towards Kismayo. They reached Bulo Marer (Kurtun Warrey district) and were heading to Baravo. December 28, 2006: after only six months in power and the defeat of the ICU's army, Ahmed committed himself to fighting the Ethiopian forces in Somalia. After the ICU's defeat in the Battle of Jilib and their abandonment of Kismayo, he fled towards the Kenyan border. About 500 Ethiopian soldiers, 200 Somali soldiers, and 1,000 Insurgents were killed in the fighting in 2006. Military events in January 2007 focused on the southern section of Somalia, primarily the withdrawal of ICU forces from Kismayo, and their pursuit using Ethiopian air strikes in Afmadow district concurrent to the Battle of Ras Kamboni. During this battle, the U.S. launched an airstrike conducted by an AC-130 gunship against suspected Al-Qaeda operatives. A second airstrike was made after the battle later in January 2007. Hence, in January 21, Kenyan police detained Ahmed and three other Somalis near Hulugo border. He met the US Ambassador to Kenya for talks regarding cooperation with the TFG. He was under the protection of Kenyan authorities staying at a hotel in Nairobi. In February 1, Sharif Ahmed was released from Kenyan police authorities. By February 8, Sheikh Sharif Sheik Ahmed had gone to Yemen where other ICU members are thought to have also gone. Regional concern had been heightened since November 2, when the US Embassy in Nairobi issued a terrorist warning of suicide attack threats in Kenya and Ethiopia. By the end of March, the fighting intensified in Mogadishu and more than a thousand people, mostly civilians, were killed. Combat deaths numbered 9 Ethiopian soldiers, 6 Somali soldiers, and an unknown number of insurgents. Hawiye clan militiamen allied with the Islamists clashed with TFG and Ethiopian troops. In December 2007, the Ethiopian troops withdrew from the town of Guriel, and the Islamists controlled Guriel after that. Ethiopia had a big military base there to secure the road linking the two countries. By the end of December 2007, the ICU forces had taken control of about half of the port city of Kismayo, around half the districts of Mogadishu, and totalling around 80% of their former territories, leaving the Ethopiean-backed regime in the same precarious situation as it was in Baidoa at the start of 2007. In February 2008, the Insurgents captured the town of Dinsoor after probing it several times. This marked a change in their strategy which previously focused mainly on the capital Mogadishu. In late May after capturing the two towns near Kismayo. The Insurgents agreed not to attack Kismayo a city ruled by clan militia who took part in the Ethiopian invasion. They agreed to pay 30% to Al-shabab and 30% to the Islamic Courts. Along with that the Islamists were bold enough to start an Islamic court 90 km away from the capital Mogadishu. On March 3, 2008, the United States launched an air strike on Dhoble, a Somali town. U.S. officials claimed the town was held by Islamic extremists, but gave few details to the press. It was reported that Hassan Turki was in the area. The same area was targeted by U.S. bombers one year earlier. A successful air strike occurred on May 1 in Dhusamareb. It killed the leader of Al-Shabab Aden Hashi Eyrow along with another senior commander and several civilians; however, the attack did nothing to slow down the Insurgency. After long talks in Djibouti over a ceasefire between the TFG and the moderate Islamists of the Alliance for the Reliberation of Somalia, agreement was reached that the parliament would be doubled in size to include 200 representatives of the opposition alliance and 75 representatives of the civil society. A new president and prime minister would be elected by the new parliament, and a commission to look into crimes of war would be established. A new constitution was also agreed to be drafted shortly. In July 2008, Ethiopian soldiers and ICU militants clashed at Beledweyne. The fighting was indecisive, and Ethiopian forces withdrew. According to media reports, 39 ICU insurgents were killed in the fighting, while Ethiopia estimated that 71 militants had been killed. Fifty Ethiopian soldiers were also killed. In early December 2008, Ethiopia announced it would withdraw its troops from Somalia shortly, and later announced that it would first help secure the withdrawal of the AMISOM peacekeepers from Burundi and Uganda before withdrawing. The quick withdrawal of the AMISOM peacekeepers was seen as putting additional pressure on the United Nations to provide peacekeeping. Somali troops on December 31, 2008, were seen by civilians packing up supplies and forwarding troop deployments except in the city of Mogadishu. December 31, 2008 was supposed to be when the troops were to withdraw from Somalia but it appears it will be several weeks after the resignation of President Yusuf earlier in December. With a power vacuum growing, it is unknown who will capitalize on the situation. Combat continued throughout January. Fourteen Ethiopian soldiers were killed, mostly in roadside bombings and attacks. On January 25, 2009, Ethiopian troops completely pulled out of Somalia. While the Ethiopian government claimed mission accomplished in its effort to give TFG presence in Mogadishu to lead to a coalition government, most saw Ethiopia's intervention was a failure, given the Islamists' quick advance following the Ethiopian withdrawal. Al-Shabab captured Baidoa, where the TFG parliament was based, on January 26. Following the collapse of the TFG, pro-TFG moderate Islamist group Ahlu Sunnah continued to fight al-Shabaab and captured a few towns. Moderate Islamist leader Sheikh Sharif Ahmed was elected to become the new President of a United Somali government signaling the end of the Transitional Federal Government marked by the resignation of Abdullahi Yusuf Ahmed the previous month and a joint unity government of the ARS-TFG. Sheikh Sharif Ahmed, 42, has promised to "forge peace with east African neighbors, tackle rampant piracy offshore and rein in hardline insurgents". Some, like the deputy major of Mogadishu Abdelfatah, said that the Ethiopian intervention was instrumental in establishing the internationally recognized government in the capital. However, most of the territory that came under the control of the new ARS-TFG government was controlled by the moderate wing of the insurgency, the ARS, which was made up mostly of former members of the Islamic Courts Union. "Analysts say Ahmed has a real possibility of reuniting Somalis, given his Islamist roots, the backing of parliament and a feeling in once hostile Western nations that he should now be given a chance to try to stabilize the Horn of Africa nation". New TFG President Sheik Sharif Sheik Ahmed arrived in Mogadishu as a president for the first time on February 7, 2009. The al Shabaab and other radical Islamists began firing at the new TFG president hours later. They accuse the new President of accepting the secular transitional government. Mediation has begun between the Islamic Party and the Transitional Government of Sharif as well as a growing divide is being reported in the Al Shabaab organization that controls much of southern Somalia as a large number of Al Shabaab leaders that held positions in government during the six-month reign of the Islamic Courts Union in 2006 have met behind closed doors with the President of the Transitional Government and the TFG have announced that Sharia law will be implemented in Somalia, but it has not acted on it. TFG President Sharif's moderate Islamist forces and AU troops clashed with the Islamic Party and al Shabaab forces, leading to at least 23 death. Moderate Islamist and other pro-TFG militias are allegedly being trained by Ethiopia, while the newly formed Islamist Party is established by Eritrea-based Sheikh Aweys. The withdrawal of Ethiopian troops, and election of the new Islamist leadership, in early 2009 has not brought a conclusion to the conflict. The fighting has now shifted into a struggle between hard line Islamist factions and more moderate factions within the government. The Islamic Courts Union has switched sides. There has been limited involvement by Ethiopia. Ahlu Sunnah Wal Jamee'a militias attacked al Shabab Islamists in central Somalia including killing an Islamist commander. Ahlu Sunnah clan militias, reportedly armed by Ethiopia, retook control of Galgadud's provincial capital Dhusamareb and the trading town of Guri El in fierce battles that killed upwards of 100 people. As of December 2008, The Elman Peace and Human Rights Organisation said it had verified that 16,210 civilians had been killed and 29,000 wounded since the start of the insurgency in December 2006. In September of that year they had documented 1.9 million displaced civilians from homes in Mogadishu alone during the year 2007. Prime Minister Nur Hassan of the transitional government and Sheikh Sharif Sheikh Ahmed of opposition group Alliance for the Re-Liberation of Somalia (ARS) signed a power sharing deal in Djibouti that was brokered by the United Nations. According to the deal, Ethiopian troops withdrew from Somalia, giving their bases to the transitional government, African Union (AU) peacekeepers and moderate Islamist groups led by ARS. Following the Ethiopian withdrawal, the transitional government expanded its parliament to include the opposition and elected Sheikh Ahmed as its new president on January 31, 2009. On June 3, 2007 a truck bomb exploded outside the home of the Somali interim prime minister, Ali Mohamed Ghedi. At least six people were killed and 10 injured – most of them bodyguards. On February 22, 2009, al-Shabaab carried out a suicide car bomb attack against an African Union military base in Mogadishu, killing at least 11 Burundian peacekeepers. On December 3, 2009, an Al-Shabaab militant dressed as a woman entered a medical school graduation ceremony and blew himself up killing 23 people including three ministers of the Transitional Federal Government. The Ethiopian Army is equipped with predominantly Soviet-made weapons while TFG and Islamic weapons vary, having mostly small arms. The following table should not be considered exhaustive. Abdullahi Yusuf Ahmed – TFG president, former leader of the SSDF. Mohamed Omar Habeeb (Mohamed Dheere) – controlled Jowhar region with the help of Ethiopia; after losing in Mogadishu as part of the ARPCT, regrouped his militia in Ethiopia and since returned (see Battle of Jowhar). Muuse Suudi Yalahow – Controlled Medina District in Mogadishu but was forced to flee by the ICU. Has since returned to the city. Hussein Mohamed Farrah – son of late General Mohamed Farrah Aidid. Although his father was a key anti-U.N. force in the mid-1990s, Farrah is a naturalized U.S. citizen and former U.S. Marine who controlled Villa Somalia. Former leader of the SRRC militia. The Sudan Tribune says Farrah is in the patronage of Ethiopia, and Western interests see him as their best hope to improve Somali-Western relations. Abdi Hasan Awale Qeybdiid – former finance minister under Gen. Aidid; arrested in Sweden for warcrimes, but later released due to lack of evidence. Colonel Hasan Muhammad Nur Shatigadud – affiliated with the Rahanweyn Resistance Army (RRA). Came to power after his militia (with the help of Ethiopian paramilitary forces) drove out Aidid's militia from Baidoa, which became the seat of the transitional government. Currently TFG Minister of Finance. Barre Aadan Shire "Hiiraale" – leader of the Juba Valley Alliance (JVA); controls Kismayo (and until its loss to the ICU, Marka region). Hassan Dahir Aweys, head of the ICU shura council, former Somali colonel, listed by the U.S. as a terrorist for heading Osama bin Laden-supported Al-Itihaad al-Islamiya in the 1990s. Fazul Abdullah Mohammed, listed as a terrorist by the U.S. for reported involvement in the 1998 U.S. embassy bombings. Some sources claim that he was a target of the U.S. AC-130 raid. His death by the AC-130 raid was later reported by Somali authorities, but denied by US officials. Aden Hashi Farah "Eyrow", led commandos of the ICU's Hizbul Shabaab movement against Ethiopian-backed forces in the Battle of Baidoa, before fleeing and being targeted by the U.S. AC-130 raid that killed eight people on January 8, 2007. Was named Al-Qaeda's leader in Somalia in March 2007. He was killed in a U.S. air strike on the May 1, 2008. ^ "Somalia signs deal with militia – Africa". Al Jazeera English. March 16, 2010. Retrieved July 9, 2011. ^ "Malawi to send peacekeepers to Somalia | ReliefWeb". Reliefweb.int. January 22, 2006. Retrieved July 9, 2011. ^ "Fighting erupts in northern Somalia as peace talks falter, says Islamic official". International Herald Tribune, Associated Press. November 6, 2006. Retrieved January 5, 2007. ^ "Somali prime minister says government is surrounded". Associated Press. November 6, 2006. Retrieved January 5, 2007. ^ a b Yare, Hassan (December 13, 2006). "Troops dig in as Somalia war fears grow". Relief Web, Reuters. Retrieved January 5, 2007. ^ Mohamed, Guled (December 25, 2006). "Ethiopian jets strike Somali airports". Reuters. Retrieved January 5, 2007. ^ "Somalia 'needs peace force soon'". BBC News. January 5, 2007. Retrieved May 27, 2010. ^ Ignatius, David (May 13, 2007). "Ethiopia's Iraq". The Washington Post. Retrieved May 27, 2010. ^ "Ethiopian army accomplished 75% of mission in Somalia – Zenawi". SudanTribune article. Retrieved July 9, 2011. ^ Ignatius, David (May 13, 2007). "Ethiopia's Iraq". Washington Post. Retrieved May 16, 2007. ^ "Ethiopian army accomplished 75% of mission in Somalia – Zenawi". Sudan Tribune. December 29, 2006. Retrieved January 5, 2007. ^ "Ethiopian PM says Somalia's Islamists have suffered thousands of casualties". International Herald Tribune, Associated Press. December 26, 2006. Retrieved January 5, 2007. ^ "'Thousands' desert Somalia forces". BBC News. December 12, 2008. Retrieved May 27, 2010. ^ "Sharif back in Mogadishu as death toll hits 16,210". Reuters. December 11, 2008. ^ a b "ReliefWeb ť Document ť Nearly 9,500 Somalis die in insurgency-group". Reliefweb.int. September 16, 2008. Retrieved July 9, 2011. ^ "Home". Garowe Online. March 10, 2009. Archived from the original on March 12, 2009. Retrieved July 9, 2011. ^ "President Yusuf made the failed and unpopular decision to call in troops from neighbouring Ethiopia". BBC News. December 30, 2008. Retrieved July 9, 2011. ^ Apunyu, Bonny (December 22, 2006). "Carnage as Somalia 'in state of war'". CNN. Archived from the original on January 6, 2007. Retrieved January 5, 2007. ^ "Ethiopian prime minister says his country is at war with Islamists in Somalia". International Herald Tribune, Associated Press. December 24, 2006. Retrieved January 5, 2007. ^ "Ethiopia launches open war in Somalia". New York Times. December 26, 2006. Archived from the original on September 12, 2012. Retrieved January 17, 2007. ^ Abdinur, Mustafa Haji (December 23, 2006). "Somali Islamists give Ethiopia one-week deadline to withdraw troops". Agence France Presse. Retrieved January 5, 2007. ^ "Al-Qaida suspects still alive in Somalia". Associated Press. January 11, 2007. Archived from the original on January 9, 2007. Retrieved January 11, 2007. ^ Rice, Xan (January 3, 2007). "Ethiopian troops to leave Somalia 'within weeks'". The Guardian. London. Retrieved May 27, 2010. ^ "Somalia Conflict Risk Alert" (Press release). International Crisis Group. November 27, 2006. Archived from the original on January 9, 2007. Retrieved January 5, 2007. ^ "Moderate Islamists seize town from Somali insurgents". Monstersandcritics.com. January 29, 2009. Archived from the original on July 31, 2010. Retrieved July 9, 2011. ^ "Moderate Islamic group claims victory over rival hardline group". Mareeg.com. Retrieved July 9, 2011. ^ "Ahlu Suna Wal Jamea supported by Ethiopian government". Ethioforum.org. Retrieved July 9, 2011. ^ "Moderate Islamist picked as Somali president". Edition.cnn.com. January 31, 2009. Retrieved July 9, 2011. ^ Sheikh, Abdi (February 7, 2009). "Rebels target new president". In.reuters.com. Retrieved July 9, 2011. ^ "Remnants of Somalia Islamists still pose a threat – official". Associated Press. January 4, 2007. Archived from the original on February 3, 2007. Retrieved January 4, 2007. ^ Chick, Court; Albert Grandolini (September 2, 2003). "Somalia, 1980–1996". Central, eastern, and southern Africa database. onwar.com. Retrieved January 5, 2007. ^ "Ethiopian-Somalian Border Clash 1982". Wars of the World. onwar.com. December 16, 2000. Retrieved January 5, 2007. ^ "Somalia: Ethiopia Denies Troop Incursion Allegations". University of Pennsylvania – African Studies Center. April 12, 1999. Retrieved January 15, 2007. ^ "Ethiopian Troops Enter Somalia to Resist Islamic Militia". PBS. July 20, 2006. Retrieved January 5, 2007. ^ "Somalis vow holy war on Ethiopia". EthioBlog. Nazret.com. October 9, 2006. ^ Ethiopia and Somalia: In Denial[permanent dead link], Stratfor. ^ "Ethiopian convoy 'attacked' in Somalia". AAP. November 20, 2006. Archived from the original on May 9, 2007. Retrieved January 6, 2007. ^ "Witnesses: 6 Ethiopian soldiers killed in ambush by Somalia's Islamic fighters". International Herald Tribune, Associated Press. November 19, 2006. Retrieved January 6, 2007. ^ "'Heavy fighting' in Somali town". BBC. December 8, 2006. Retrieved January 6, 2007. ^ "Fresh fighting erupts in Somalia". Al Jazeera. December 8, 2006. Retrieved January 6, 2007. ^ "Ethiopian tanks roll in Somali battle's fourth day". Alertnet.org. Retrieved July 9, 2011. ^ "Ethiopia admits Somalia offensive". BBC. December 24, 2006. Retrieved January 17, 2007. ^ Farah, Mohamed Abdi (January 1, 2007). "Somalia: Islamists lost their last strongholds". SomaliNet. Archived from the original on January 17, 2007. Retrieved 2007-01-01. ^ "Military Official Reports Second US Air Strike in Somalia". Voice of America. January 24, 2007. Archived from the original on February 15, 2007. Retrieved February 6, 2007. ^ "Ethiopia leaves key Somali town". BBC. December 28, 2007. Retrieved December 28, 2007. ^ "Al Jazeera English - News - Somalia Says Rebels Regrouping". Archived from the original on March 10, 2008. Retrieved February 18, 2016. ^ "Latest News". SomaliNet. Archived from the original on July 19, 2011. Retrieved July 9, 2011. ^ "Somali town overrun by Islamists". BBC News. February 25, 2008. Retrieved May 27, 2010. ^ "Air raid kills Somali militants". BBC News. May 1, 2008. Retrieved May 27, 2010. ^ "Somali parliament to be doubled". BBC News. November 26, 2008. Retrieved May 27, 2010. ^ "Somali gov't, opposition sign power-sharing deal – People's Daily Online". English.people.com.cn. November 26, 2008. Retrieved July 9, 2011. ^ "DAILY NATION – Somali MPs accept terms". Nation.co.ke. Retrieved July 9, 2011. ^ "Ethiopia to pullout Somalia after guarantying safe departure of AU troops – PM". SudanTribune article. Retrieved July 9, 2011. ^ a b "Home". Garowe Online. December 31, 2008. Archived from the original on January 2, 2009. Retrieved July 9, 2011. ^ a b "Islamist leader wins Somali presidency - Yahoo! Canada News". Archived from the original on February 3, 2009. Retrieved February 18, 2016. ^ "Somalia: Counting the Cost After Ethiopia Withdraws". Allafrica.com. Retrieved October 17, 2014. ^ Derek Kilner (February 10, 2009). "Somalia's New President Continues Push for Insurgent Support". Voanews.com. Archived from the original on March 18, 2009. Retrieved July 9, 2011. ^ "Violent clashes in Mogadishu kill 23". Google.com. February 24, 2009. Retrieved July 9, 2011. ^ "Ethiopia-armed clan militias defeat islamist insurgents". Garoweonline.com. February 11, 2009. Archived from the original on February 29, 2012. Retrieved July 9, 2011. ^ "Search – Global Edition – The New York Times". International Herald Tribune. March 29, 2009. Retrieved July 9, 2011. ^ "Somalia conflict kills more than 2,100 this year". International Herald Tribune. March 29, 2009. Retrieved July 9, 2011. ^ "Bomb attack on Somali PM's house". BBC News. June 3, 2007. Retrieved May 27, 2010. ^ "AU base in Mogadishu attacked". BBC News. February 22, 2009. Retrieved February 22, 2009. ^ ""Somalia graduation ceremony blast kills 23," December 4, 2009". Cnn.com. December 4, 2009. Retrieved July 9, 2011. ^ ""Three ministers killed in Somalia attack," December 3, 2009". Newvision.co.ug. December 3, 2009. Archived from the original on January 6, 2010. Retrieved 2011-07-09. ^ a b "The Ethiopians have always been tough, mean". Agence France Presse. December 20, 2006. Retrieved January 5, 2007. ^ Osman, Ali (August 24, 2006). "Ethiopia: Zenawi's sea of lies". Sudan Tribune. Retrieved January 4, 2007.